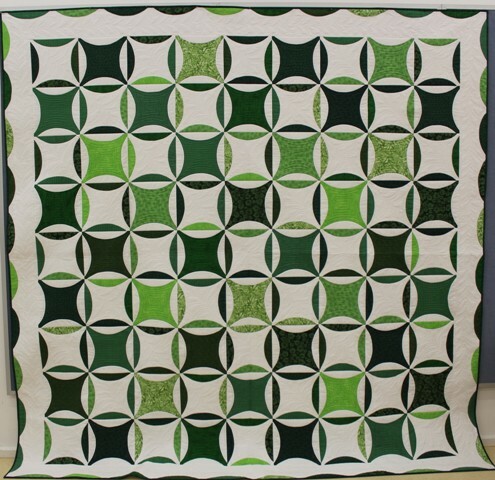 Canberra Quilters 2013 raffle tickets available now | Canberra Quilters Inc. This is the raffle quilt for 2013, Pantone Premonition. It was made by Barbara Cutmore and Raylee Bielenberg. 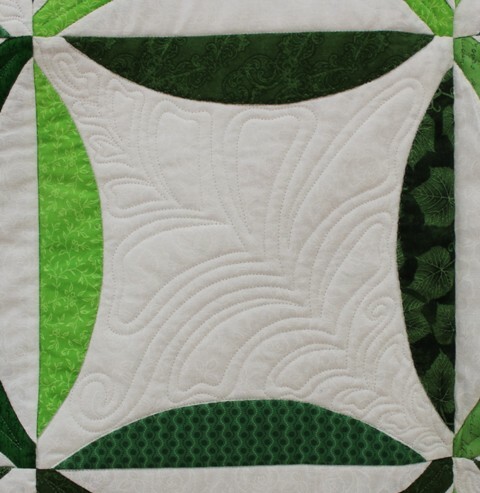 It was quilted by Raylee Bielenberg of Sunflower Quilting. It is based on the Robbing Peter to Pay Paul block and using white and variations of the Pantone Colour of the Year for 2013 – Emerald Green. The quilt is 251cm square. a Kingfisher 65″x 65″ Design Wall valued at $240, kindly donated by Jackie McNab of Brindabella Quilting. The remaining prizes will go to the second and third drawn tickets. The raffle will be drawn at 4.00pm on Sunday 11 August 2013 at the close of the Canberra Quilters Inc Members’ Exhibition. This year (until 1 August and within Australia only) you can buy books of 10 tickets by post for $10 each, paid by cheque or money order made out to Canberra Quilters Inc – NO CASH PLEASE! Send a Self Addressed Stamped Envelope* (for return of the tickets) with your cheque or money order to Canberra Quilters Inc, PO Box 935, JAMISON CENTRE, ACT 2614. * Please note that if no SASE is included then only 9 tickets will be sent as $1 will be deducted for post and handling. Darwin Patchworkers & Quilters Inc. The Quilters' Guild of NSW Inc. Please see Canberra Quilters Inc. Legal Notices and Disclaimers for further information. © 2013 Canberra Quilters Inc | Reproduction of any material on this website, including both text and images, without the written permission of Canberra Quilters Inc, is strictly prohibited.